That means the G7 One has an older chipset, less RAM, less storage and just a single rear camera versus the G7 ThinQ. It's still a decent line-up of specs though, and if LG can get the price right it could be an attractive offering. But you still get the large 6.1-inch QHD+ display, 4GB of RAM, a microSD card slot and the choice of either 32GB or 64GB of storage - along with a 3,000mAh battery and Android 8.1 Oreo. 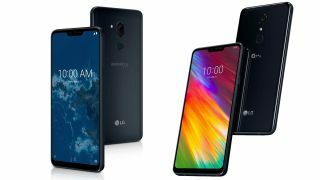 There's currently no word on the LG G7 One and G7 Fit release date, price and availability, but we'll update this article as soon as we know more. We'll be getting hands on with both smartphones at IFA 2018 this week, so keep an eye out for our first look reviews of the handsets.